How long have you been at Liquorland and what store are you with? I have been working under the Liquorland banner most of my working life – I first started in 1986 at Liquorland Thames. I currently own Liquorland Newmarket and Liquorland Remuera. How did the Liquorland journey begin for you? I first started working at Liquorland Thames during the university summer holidays in 1986/7. My manager then got me a part-time job at Liquorland in central Auckland while I was studying. I did this for three years, which was great. When I had completed my degree I was still unsure what I was going to do career-wise so my manager offered me the job of assistant manager – I ended up doing this for a couple of years before doing my OE. After four years overseas, I came back to New Zealand to find many of the old managed Liquorland stores had been franchised. I was able to secure a job as manager at Liquorland Papatoetoe. I was always keen to work for myself, so when the opportunity to buy Liquorland Pt Chevalier came along in 1999, I jumped at the chance and have never looked back! I have since set up Liquorland Albany (since sold), bought Liquorland Parnell (since closed), Liquorland Newmarket (which I still own) and set up Liquorland Boutique Remuera (still own this one too!). What has been your best memory from your time with Liquorland? Besides the many great conferences and other supplier junkets, the best memory would have to that first day being in my own Liquorland - opening up and the first sale going in the till. I change from week to week, but a really good craft beer might just win the contest over a bottle of chardonnay or red. 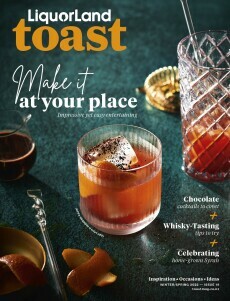 My favourite Toast cocktail is the Negroni.